This is another one of those confusingly titled recipes from Joanne Chang’s cookbook Flour, too (pp. 194–197). As a pastry chef by training, Chang depends on other chefs to handle the savory side of her Flour Bakery-Cafes; the “Corey’s” in the title refers to Chef Corey, who developed it as a winter dinner special. In the past two posts (“Tutorial: Making Joanne Chang’s Pâte Brisée” and “Tutorial: From pie dough to pie crust“) I covered the making of the pastry case for this pie in great detail — since making pie crust is a pretty fundamental baking skill it seemed like it was worth it. (Let me know if you’d like to see other basic baking procedures covered in comparable detail — actually, I’d love to get any feedback at all!) I’m going to go through the rest of the recipe pretty quickly, since it’s fairly standard. I ended the last installment with a fully blind-baked bottom crust for the pie, plus an uncooked top crust resting in the refrigerator. Now it’s time to make the filling — a mixture of aromatic vegetables, peas, a diced potato, and a pound of cubed chicken breast in a chicken-flavored velouté sauce. First, I’m going to go back in time a little bit. Chicken of whatever variety is much easier to cut evenly if it is first frozen stiff — not quite solid, but firm enough that it doesn’t squish under the pressure of a knife. Since the package of boneless chicken breast I bought had three half-pound breast halves in it, and I only needed a pound of meat, I took the third portion and stuck it in a plastic zip-top bag. The other two pieces I simply laid flat on my nylon cutting board (used only for meat) and stuck them, uncovered, directly in the freezer. I left them in the freezer while the crust was cooling, so they got reasonably firm (the more so as I found that my celery was bad and I had to make an emergency trip to the store) but not rock-hard. 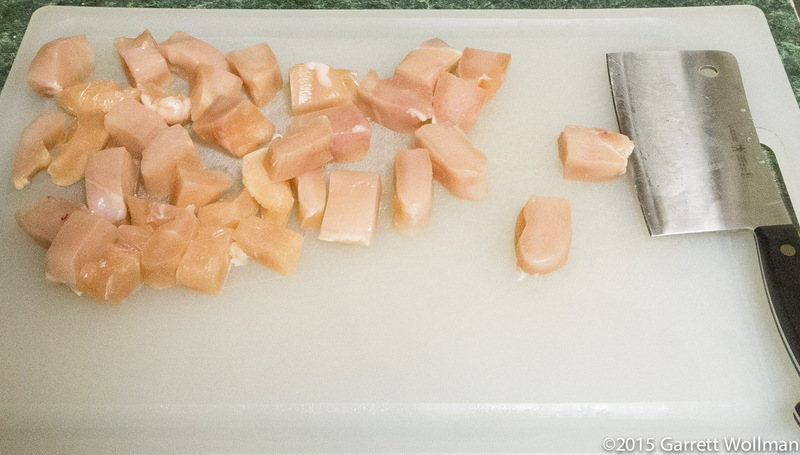 A good cleaver makes short work of cubing the semifrozen chicken breast. I put the cubed chicken aside while I worked on the rest of the filling — of which <sound effect="sad trombone"/> I took no pictures. But it’s a fairly standard preparation: the vegetables are cooked in butter, the meat is added, then everything is mixed with flour to form a roux, and finally herbs (only thyme in this recipe), seasoning, and chicken broth are added to turn the roux into a velouté. The sauce is enriched with a small amount of cream (which I probably wouldn’t notice if it wasn’t there), and the whole mess gets dumped out of the sauté pan into the pre-baked pastry case. 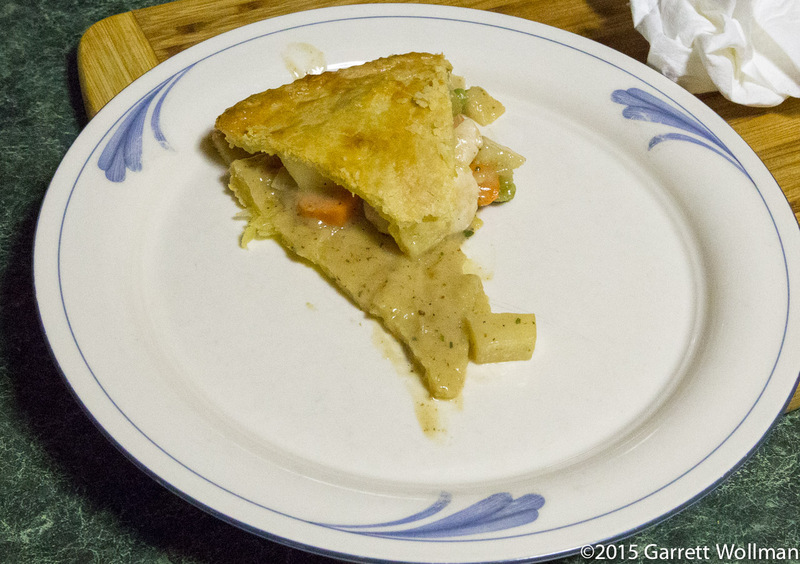 It appears that I chose my dish wisely, as the filling came just up to the top of the pie shell. I took the top crust out of the refrigerator and cut a hole in the center to allow steam to escape — if I had a pie bird I might have used it here — before pressing it firmly onto the top of the filling. 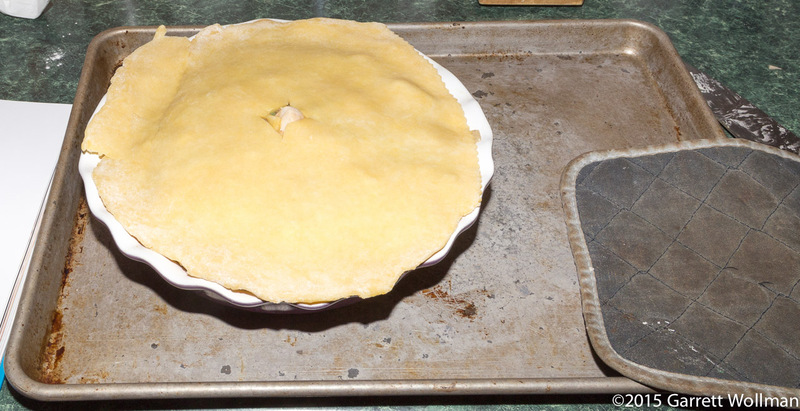 A bit of egg wash on top and the pie goes into the oven for a relatively short time, only half an hour (the filling having been partially cooked already). Looks lovely, doesn’t it? (Well, unless you’re a vegetarian, I suppose!) The pie has to sit on the cooling rack for another quarter of an hour — there’s a lot of carryover and it’s still cooking — but eventually it’s ready to cut into. Ideally, you’d like the sauce to be rather thicker, so that the filling stays in place rather than immediately flowing out into the vacant slice. I wonder if I didn’t cook it enough on the stove before putting the filling in the case? A bite confirms it: the potato is still crunchy, which it definitely should not have been. Oh well, better luck next time. I’ll have to see how it does on the reheat. 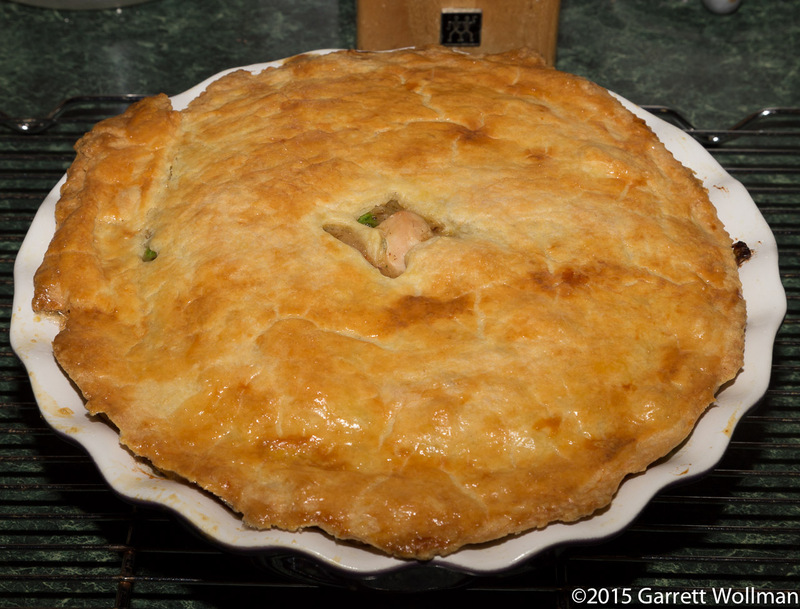 On the positive side: this is an incredibly easy recipe to make; it requires no unusual ingredients or procedures, and Chang provides an alternative version with a biscuit topping in place of the pastry crust, so I can easily see myself trying this again (and hopefully nailing the cooking time). For about an hour of active cooking time (about three hours total) I ended up with a creamy, nutritious meat pie that will easily make four or perhaps even more meals. UPDATE: After chilling the rest of the pie completely, the velouté did solidify, allowing me to get a rather nice quarter-pie slice for the reheat. (It’s over 800 kcal but that’s no worse than a decent hamburger, and I did plan for it by having a light lunch.) Even on the reheat it wasn’t as runny, but the pastry did stick a little to the bottom of the pie dish, so perhaps I didn’t do a very good job of lubricating it before I built the crust. 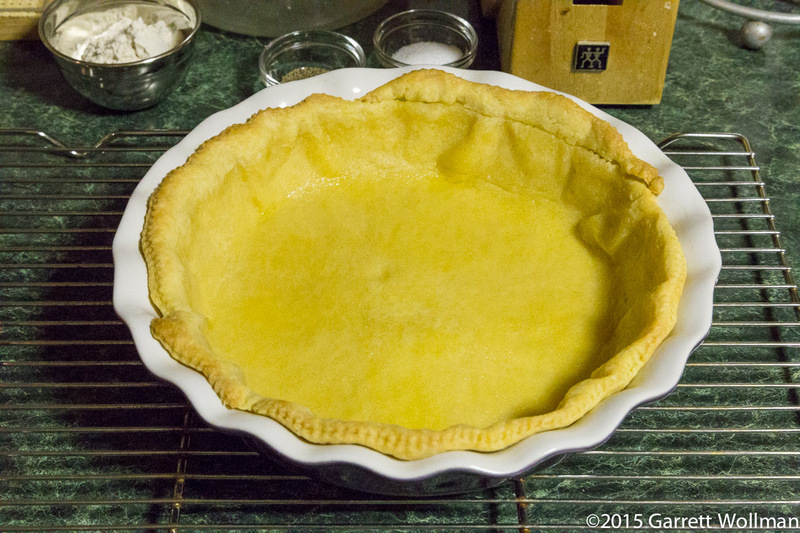 The fluted edges of this dish make it difficult to slide the pie taker underneath a slice. Despite that, it looked fabulous, and reheated quite nicely, although I still think the filling needed to cook a bit more. The recipe says that it serves 6 to 8. I’m probably going to end up eating the pie in quarters (still not a bad use of meat, if you consider that most meals have more than a quarter-pound of meat in them! ), although if I were sharing then I’d go to the effort of cutting it in sixths, and that’s what I’ve presented here. 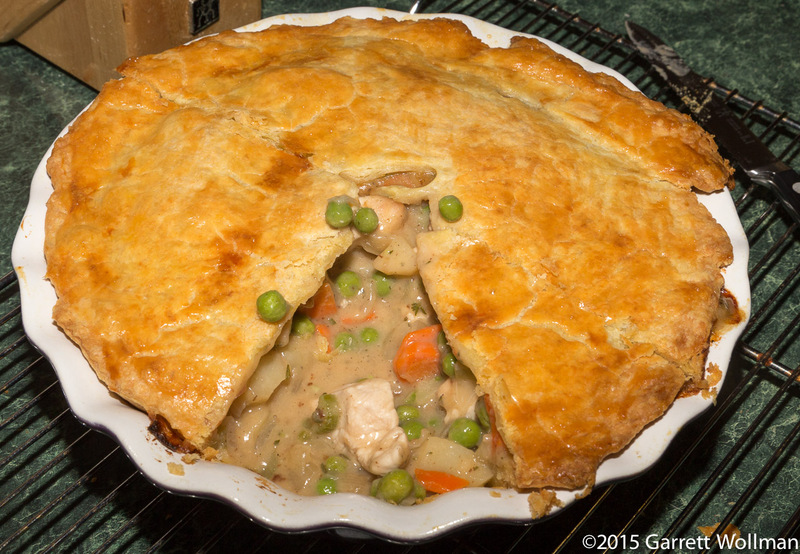 This entry was posted in Food and tagged chicken, Joanne Chang, meat, pie, pot pie, recipe. Bookmark the permalink.